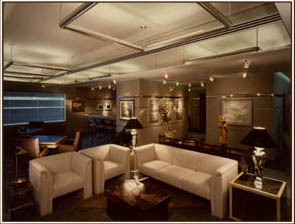 Q: Why consult an interior designer? JA: Primarily to protect your investment of time and materials from costly and frustrating mistakes while translating your fantasy into reality. This is a field where Murphys Law runs rampant. A good designer helps you accomplish the task in an orderly, professional manner with design expectations, budgets and time constraints kept in balance. The designer must interpret the clients innermost feelings of image as perceived by others, whether the client is individual or corporate. This demands continuous attention from concept to completion. The designer can help you avoid anxiety and confusion and can make the process more comfortable, confident and enjoyable. Q: When should the designer be consulted? The staging of the subtle mix of functional ease with aesthetic appreciation creates the almost subliminal comfort of a well designed space. Q: In addition to space planning, what other important contributions can the designer make? JA: The designer is an "imaginist." He can help you go beyond the concept you conceive to an even grander solution. A solution that is not at first evident, but when discovered, is "obvious." Good design is self-evident, but only "obvious" in hindsight. Good design creates poetry for the eyes. Q: Your work is quite diverse. Do you have a "signature look"? JA: No. On the contrary, we feel each job is unique and calls for a look appropriate to the client or the market image, not a re-expression of our own design image. If a lady commissions a custom gown and arrives at the function only to see another woman in the same "custom" design gown, they would both be justifiably irate. We feel interior design is similarly unique. Each client has a self image that we attempt to interpret for them. Q: I understand that Adams Design's special area of emphasis and expertise is hotel and restaurant design. JA: Yes, hotel and restaurant design gives full reign to our imagination and artistic ability. Hotels are like a city in miniature. Environments suitable for most of lifes activities are involved  sleeping, eating, playing, shopping, conducting business, entertaining and being entertained. From extensive work in this area, our firm has gained a great deal of experience in all aspects of commercial interior design. We can and do involve ourselves in every visual reference from the overall concept, to furniture design, graphics, signage, uniforms, table settings, and lighting. One of our main strengths is the sense-of place and heritage that we convey in our design. Our goal is to create "classic" designs for today  designs that will stand the test of time without seeming "trendy" or "dated" in the future. 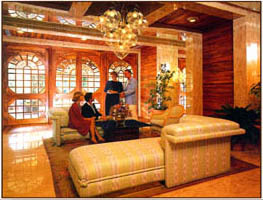 Our hotel design conveys the warmth of a residence. Our residential design captures the drama usually only seen in hotel design. Q: Why choose Adams Design? Because Adams Design is a company big enough to handle production on a timely basis, but small enough to have personal attention of the principal designer to each client-and this is a very personal business. Interior commissions today involve a considerable investment of both money and emotions. To protect this investment requires the careful guidance of one trained both in technical expertise as well as purely aesthetic and artistic determinations. As a designer with 20 years of experience, a product of West Point and the prestigious Art Center College of Design, Adams is a rare blend-a true artist (sculptor, painter, printmaker) and a disciplined businessman.